I'll trade a frag with yah. Looking for a dif zoo color??? I have a few nice ones. If I knew keeping fish would be so hard, I would of had kids by now. Qwiv- send me some pics. chill man it's all good just answering a question the dog asked me. good luck with the sale of your zoanthids. I will take a pic of my zoos tonight. what would you be willing to trade for a frag of those? I have some hairy mushrooms, red mushrooms and some purple mushrooms along w/ some daisy polyps. lmk. definitely interested. Something seems a little fishy around here! OOh, I want a trade. I'm in Sunnyvale. I have only 1 frag left. looking for PPE or PHE zoos. 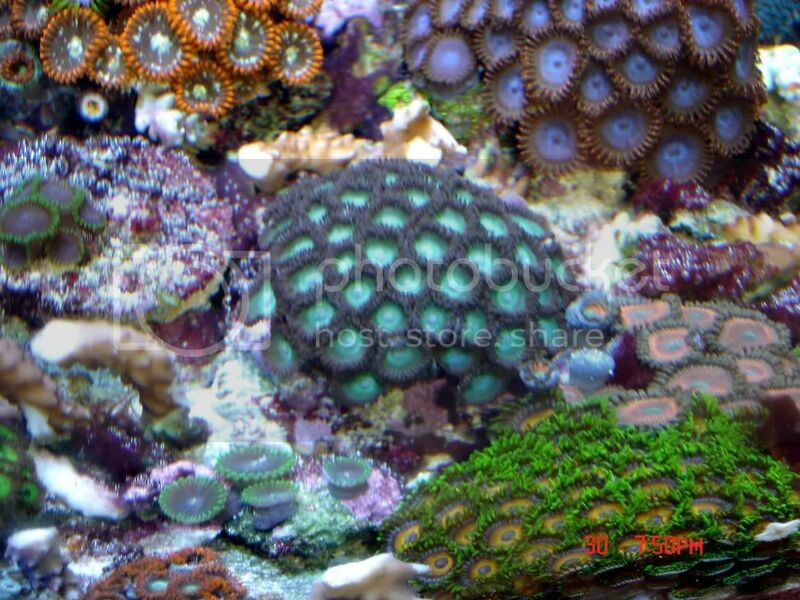 ask Rock Anemone how crazy these zoos are. Brightest thing in the tank so far, need to get my camera working! i got another morph of the zoos that i sent you. instead of green center, these are blue center. i can send you a few polyps. thanks again. hope to see a picture soon.